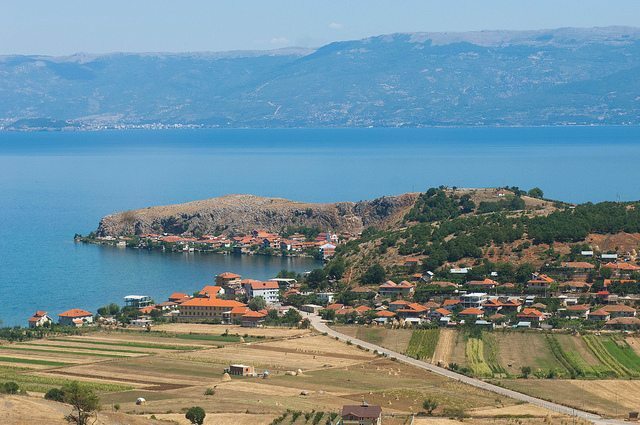 Lake Ohrid region is home to nearly 160,000 people, with more than 52,000 residing in Albania. Every year, approximately 300,000 visitors explore the region’s natural and cultural heritage. While in Macedonian side of the lake, summer tourism rhymes easily with cultural tourism, this is not happening in the Albanian side of the lake. “The main threat in wetlands like the Lake Ohrid region is the fact that it is exclusively used as a sunny weekend, a few hours destination, with extremely low or no income for the local people,” says Alois Lang, Austrian expert working with local authorities in Pogradec region for sustainable tourism development. The challenge for local and international experts who are working closely on this area, is to find alternative tourism-related products of interests for the general public, but also for different kinds of audiences, says Christophe Graz, heritage consultant ICOMOS, who is also working with Albanian experts to explore the tourism opportunities in the region. International and local experts are closely working together under the EU-funded project “Towards strengthened governance of the shared transboundary natural and cultural heritage of the Lake Ohrid region”. Some of them were interviewed to produce this video, which focuses on the challenges and opportunities for sustainable tourism. The video was published lately with the support of UNESCO, aiming at raising awareness about values and threats of Lake Ohrid site. Previous PostIt’s Youth Time! Five Young Albanians Awarded on UN DayNext PostWhy Albania Needs a Designated Dark Sky Park?